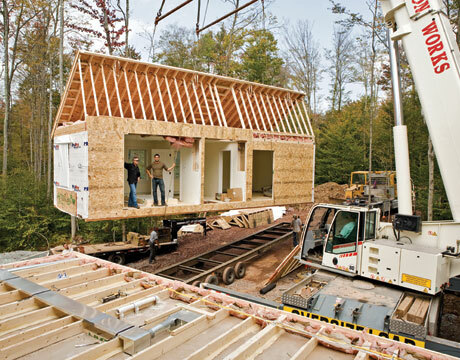 Modular homes are constructed together at your construction site, resulting in a beautiful home that is indistinguishable from their counterparts build from the ground up. These homes are designed keeping in mind all national building or state and fire codes in your final location. Since the main production is carried out in factories, the principles of automation, optimization and virtualization can be applied. This makes it possible for construction project managers to apply manufacturing technologies relying heavily on IT, virtual prototyping, drawing management, robotics and simulation into the construction of modular buildings. In conventional construction projects, issues with plans, severe weather conditions and material shortages can bring inconvenient delays. Modular factories, however, offer controlled environments for protecting your materials from natural elements and, of course, unexpected delays. But modular homes rely on the same materials and must pass the same regulation process as site built homes. You can choose a local financing source such as a bank, appraiser, or insurance company. They treat these homes the same way as site constructed homes. Get quotes from at least 4 different sources to see what kind of rates are available. Even if the rate differs by a hundredth of a percentage point, it may save you several thousand dollars over the loan’s lifespan. Banks and local mortgage brokers can further explain their financing process for modular homes. The modular home builder will work with you on a custom design utilizing special construction project management and CAD programs. Details of such software at www.procore.com indicate that these tools provide a seamless process for management and revision of project drawings. You can therefore quickly and easily view drawings of your modular home and make revisions from scratch to finish. This means you won’t be restricted to a one-size-fits-all design. In fact, one of the reasons why modular homes have are gaining acclaim is thanks to the custom and flexible designs. The modular home constructor will complete the necessary plans for building permits while you’re visualizing your choices for cabinet styles, exterior furniture, bathroom fixtures etc. Once the building permit process is taken care of, the builder lays the foundation while putting your home into production. The construction enables a quick turnaround time; the homes are often constructed in a fraction of time required for a comparable site-constructed home. Specifically, it can be as short as seven days. Full installation and associated tasks, such as electrical and solar panel installation, requires a couple of months on average for completion. That gives you a new home to reside in less than it can take on-site constructors to set foundation. Also, these homes are inspected by a third-party agency before coming out of factory and again by a local building inspector on site. Often they will exceed requirements of local building and fire codes. Modular homes are a rising industry offering perks such as energy efficiency and customization. And the construction in itself is environmentally friendly, with minimal effect on the areas surrounding the home site. A full list of modular home manufacturers is available at nahb.org/modular.